When I first saw this pin, I thought it was adorable and Father’s Day would be the perfect day to try it out. What man doesn’t love bacon, right? What could be better than bacon cookies? The pin and instructions are from Not Your Momma’s Cookie. I tried to follow her instructions exactly, but I just wanted to share a few things about my experience that hopefully will help you. You will definitely want to check out her step by step photos when you try these yourself. I was able to buy precut dowel rods at Hobby Lobby (I believe they were $2.47). The package had more than enough for my cookies and fit my cookie sheet quite well. I think my dowel rods were thinner than hers, but it still looked like bacon. I used Betty Crocker’s gluten free cake mix to make gluten free sugar cookie dough using this recipe. No one guessed the difference. Also I think my beige was too saturated/too yellow and the pinkish color was also too saturated. I used Wilton food dyes and I did not use much, but I will adjust that some in the future. I think I made my bacon slap too wide, creating long pieces of bacon. This can make for an intimidating cookie. I generally cut bacon in half before I bake it at home anyway. It makes it easier to eat and to put on sandwiches. In the photo above you can see half bacon sized cookies because…. The other obvious problem was that I placed my bacon too close together on the pan. The dough will expand some. The colder the dough was when I placed it on the pan, the more it seemed to crack as I shaped it over the dowel rods. I wonder if it would work to use alternating dowel rods on top and bottom to shape the dough. The brown sugar on the cookies gave a nice flavor, so don’t skip the pepper. The cookies will be crunchy because they have to be fully done to hold their shape. 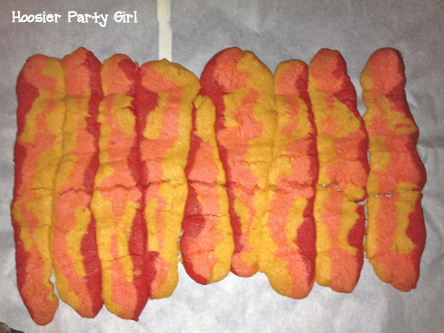 Even though mine were not as pretty as Not Your Momma’s Cookie’s Bacon cookies, they were quickly identified as bacon. They were quite good too – I had at least one too many today. 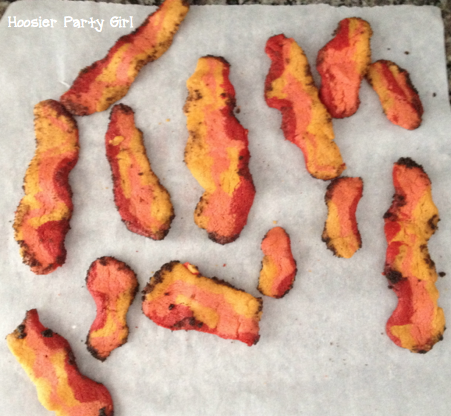 If there is a man (or woman) in your life who loves bacon, this could be a fun treat. It takes a little bit of time, but it isn’t difficult. I think these would be great for a cookout, for brunch, or for dessert when you have breakfast for dinner.